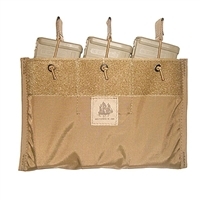 The Condor Stacker Mag Pouch is a simple, yet effective, system to carry your M4 magazine. It utilizes the open-top design with bungee cords to hold the mags in place. 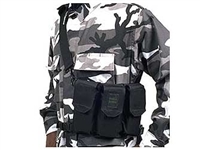 The Helium Whisper® Triple 5.56 Magazine Pouch, Open Top is designed to hold three M4 or similar sized magazines with an adjustable shock cord retention system. 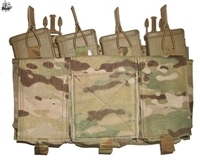 The front of the pouch has two rows of Molle webbing to attach additional Molle type pouches. Weighs only 5.25 oz. (0.15kg). All materials and workmanship are 100% Made in the USA. 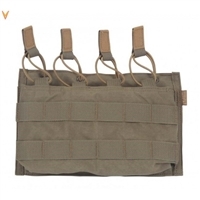 The Helium Whisper® Quad 5.56 Magazine Pouch, Open Top is designed to hold four M4 or similar sized magazines with an adjustable shock cord retention system. 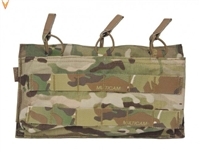 The front of the pouch has two rows of Molle webbing to attach additional Molle type pouches. Helium Whisper Attachment. All materials and workmanship are 100% made in the USA. The Triple 7.62 SwiftClip® Placard works in conjunction with our SwiftClip® attachment system on our carriers to quickly add three 7.62 magazine pouches with a molle webbing exterior. The Quad 5.56 Magazine Placard, GP is meant to be a smaller, lighter alternative to a full chest rig, and is a quick attach/detach option allowing the end user to quickly change weapon systems without removing the rest of his equipment (radio, med etc).